Recognized according to the Art. 12 C / C in Ente Morale by Decree of the President of the Lombardy Region on October 11, 1985 at No. II / R / 85 Leg. The most ancient document dates back to 1418,when on 18 May the notary, Antoniolo Giussani, drew up the contract by which a certain Ubizolo Pietrasanta sold to Ambrogio Canturio “a house consisting of divers rooms: bedchamber, attic, lobbies, communal well, bathroom, small courtyard, overlooking the contrada with no name”. In 1589 the notary, Marco Antonio Castelli drew up the contract by which the building was bought by an expert in law called Carlo Civaleri, son of the most illustrious jurist Giovanni Giacomo, lord chancellor to the Queen and Duchess of Lorraine, ceded by Bartolomeo Cantoni.On this occasion, the act provides a clear description of the property: “Consisting of a kitchen with side room, stores, stables, upper chambers to the roof, and with one side facing the street near to the piazza di San Sepolcro, and the other giving on to the Magnifico Luigi Burri”. This contrada, or area, of the city remained nameless until 1603, but its story is interwoven with that of the Scuole Taverna and Fedeltà schools, as well as the Biblioteca Ambrosiana. The famous moeny-lender Tomasone Grasso, about whom Bandello has left a striking profile in his Novelle, created Milan’s first free public schools in 1473. They were open to “poor boys, desirous of learning” and situated in the building “of the stork”, as it was known due to a sign on the wall of the building in the contrada dei Ratti. In 1492, the rich banker, Stefano Taverna, also instituted other classrooms in order to “remedy for the insufficiency of the rooms for so many children in need of learning”. The Taverna schools were also free and provided basic teaching in reading and writing. In 1616, , to allow for the enlargement of the Ambrosiana, Cardinal Federico Borromeo obtained the area occupied by the Taverna schools by means of an exchange. After various changes of ownership, the building in via dell’Ambrosiana ties its fortunes to those of an Ambrosian almshouse called the Luogo Pio di Santa Maria della Passione.From 1683 to 1774, this Luogo Pio (or pious place) had the “direct dominion” (ownership) of the house, and then from September 1774 until 1865, by will of Cesare Migliori – one of the Luogo Pio’s benefactors, the right to gather the annual level rents. It was in order to honour its obligation that in 1683 the Luogo Pio bought a house in Porta Vercellina, parish of San Mattia alla Moneta of Milan, which consists of various lower and upper chambers to the roof, portico, reception room, cellar, tables, well, two privies and other commodities, with one side of the house facing the street near to the piazza San Sepolcro, and two parts connected to the brothers Carati and the other to the Revered Friars of the Carmelite Monastery of San Giovanni in Conca of Milan “. At the time of purchase, the property was already let to a certain Carlo Orrigoni and his paternal uncle, the Rev. Can. Giovanni Battista. 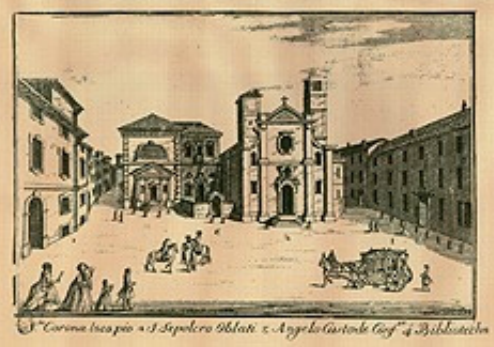 Years later, the Alms Chapter (or board of directors), conceded the building on a long-term lease to a certain Francesco Calino who received: “the said house, nominally for civil use, situated in the vicinity of San Sepolcro and facing the Biblioteca Ambrosiana of Milan, in Porta Vercellina, parish of San Mattia alla Moneta, consisting of several chambers and facing the contrada of the Biblioteca Ambrosiana on one side, the house of Signor Orsini on another, the house of the jurist Signor Crotta on another, and the Reverend Fathers of San Giovanni in Conca on yet another according to ample description of the consignment” which has reached us in its integraland complete form, dated 12 August 1774 , and drawn up by the Collegiate Engineer Francesco Bernardino Ferrari. From this description the house shows evident signs of wear: from the floors of Caravaggio brick (still visible in one of the ground floor rooms), to the locks and the balustraded loggias. On the other hand, the portico paving, some ceilings, and some parts of the roof appear to have been in good repair. On becoming the “perpetual tenant”, Francesco Calino immediately provided for the necessary improvements and changes, thus discharging his pledge to spend 3,000 lire per year in works of maintenance, as stated in the contract. The annual rent of 25 fleury zecchins, agreed in 1774, was abolished in a notarial act of July 1865, and in the same year the old address – “contrada della Biblioteca no. 3145” became via dell’Ambosiana no. 20. The building changed hands many times and suffered in the air raids of 1943. It was bought in 1978 by Emilio Carlo and his son Giuseppe Mangini who restored it, conserving as much as possible. Mangini is constantly seeking new areas in which to display his collections. In 1991, whilst inspecting what were seemingly ordinary cellars, he realised that the plastering hid walls built of ancient brick. The laborious restoration work confirmed what historical studies had presumed: the cellars were part of a building from the Fifteenth-Seventeenth centuries that had been constructed over an even older building.The double well that was discovered belongs to the late ancient period, most likely somewhere between the Sixth and Eighth centuries, although it may have been a renovation of a pre-existing Roman well.Some of the bricks that have been re-used in the circular wall of the well are definitely older than the others: they are “Roman type” and date back to a remoter era. “Deep is the well of the past,” said Thomas Mann. “The human past is the very enigma of its existence.” To explain certain evolutions biological criteria are not enough, but emotional, rational, moral, aesthetic ones are also needed; the mystery and certainty, in fact, in which the past and the present coincide. This is therefore the purpose of a unique museum, which Emilio Carlo Mangini has intensely desired and that we can consider as an act of recovery of the testimonies and conquests of the civilization of the past, that the patina of time and the frenzy of today’s life is submerging and often erasing.